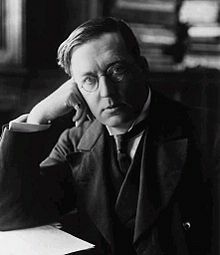 Montague Rhodes James (1862 – 1936) was a noted British scholar and expert on medieval manuscripts and biblical apocrypha. It is for his ghost stories though, that James is best remembered. M.R. James wrote over thirty ghost stories. They have rarely been out of print, are often anthologized and have been produced as audiobooks, radio plays, television dramatizations, films and on stage presentations. Casting The Runes was first published in 1911, in M. R. James’ More Ghost Stories anthology. It tells the story of a disgruntled occultist named Karswell who resorts to sinister tactics when he decides to avenge himself against those who have thwarted his literary ambitions. The movie Night of the Demon (1957) is based on this story. Dear Sir,___ I am requested by the Council of the ________ Association to return to you the draft of a paper on The Truth of Alchemy, which you have been good enough to offer to read at our forthcoming meeting, and to inform you that the Council do not see their way to including it in the programme. Dear Sir,___ I am sorry to say that my engagements do not permit of my affording you an interview on the subject of your proposed paper. Nor do our laws allow of your discussing the matter With a Committee of our Council, as you suggest. Please allow me to assure you that the fullest consideration was given to the draft which you submitted, and that it was not declined without having been referred to the judgment of a most competent authority. No personal question (it hardly be necessary for me to add) can have had the slightest influence on the decision of the Council. The Secretary of the _______ Association begs respectfully to inform Mr Karswell that it is impossible for him to communicate the name of any person or persons to whom the draft of Mr Karswell’s paper may have been submitted; and further desires to intimate that he cannot undertake to reply to any further letters on this subject. “And who is Mr Karswell?” inquired the Secretary’s wife. She had called at his office, and (perhaps unwarrantably) had picked up the last of these three letters, which the typist had just brought in. “What have you been doing to make him angry?” asked Mrs Secretary. The Secretary and his wife were lunching out, and the friends to whose house they were bound were Warwickshire people.So Mrs Secretary had already settled it in her own mind that she would question them judiciously about Mr Karswell. But she was saved the trouble of leading up to the subject, for the hostess said to the host, before many minutes had passed, “I saw the Abbot of Lufford this morning.” The host whistled. ‘did you? What in the world brings him up to town?” “Goodness knows; he was coming out of the British Museum gate as I drove past.” It was not unnatural that Mrs Secretary should inquire whether this was a real Abbot who was being spoken of. “Oh no, my dear.. only a neighbour of ours in the country who bought Lufford Abbey a few years ago. His real name is Karswell.” “Is he a friend of yours?” asked Mr Secretary, with a private wink to his wife. The question let loose a torrent of declamation. There was really nothing to be said for Mr Karswell. Nobody knew what he did with himself.- his servants were a horrible set of people; he had invented a new religion for himself, and practised no one could tell what appalling rites; he was very easily offended, and never forgave anybody. he had a dreadful face (so the lady insisted, her husband somewhat demurring); he never did a kind action, and whatever influence he did exert was mischievous. “that’s the man, do you remember the reviews of it? After a time the talk reverted to the History of Witchcraft.”Did you ever look into it?” asked the host. However, Mr Karswell was an astute man. This much is in the way of prologue. On an evening rather later in the same week, Mr Edward Dunning was returning from the British Museum, where he had been engaged in research, to the comfortable house in a suburb where he lived alone, tended by two excellent women who had been long with him. There is nothing to be added by way of description of him to what we have heard already. Let us follow him as he takes his sober course homewards. This was all that passed that evening. Mr Dunning did just go to the trouble of looking up Ashbrooke, and found that it was in Warwickshire. “Ere it is,” I says, “Mr Timms” and I laid my ‘and on it.” The conductor paused. Amid further elucidations of the proposition, George, conducted by William, left the room. The incredulity of Mr Timms (who had a nodding acquaintance with Mr Dunning) was greatly modified on the following day by what the latter could tell and show him; and any bad mark that might have been attached to the names of William and George was not suffered to remain on the Company’s books. but explanation there was none. Mr Dunning’s interest in the matter was kept alive by an incident of the following afternoon. He was walking from his club to the train, and he noticed some way ahead a man with a handful of leaflets such as are distributed to passers-by by agents of enterprising firms. This agent had not chosen a very crowded street for his operations: in fact, Mr Dunning did not see him get rid of a single leaflet before he himself reached the spot. One was thrust into his hand as he passed: the hand that gave it touched his, and he experienced a sort of little shock as it did so.It seemed unnaturally rough and hot. He looked in passing at the giver but the impression he got was so unclear that, however much he tried to reckon it up subsequently, nothing would come. He was walking quickly, and as he went on glanced at the paper. It was a blue one. The name of Harrington in large capitals caught his eye. He stopped, startled, and felt for his glasses. The next instant the leaflet was twitched out of his hand by a man who hurried past, and was irrecoverably gone. He ran back a few paces, but where was the passer-by? and where the distributor ? The solitary evening was thus obviated; at the expense of some distress and inconvenience it is true. Mr Dunning spent the time pleasantly enough with the doctor (a rather recent settler), and returned to his lonely home at about 11.30. The night he passed is not one on which he looks back with any satisfaction. He was in bed and the light was out. He was wondering if the charwoman would come early enough to get him hot water next morning, when he heard the unmistakable sound of his study door opening. No step followed it on the passage floor, but the sound must mean mischief, for he knew that he had shut the door that evening after putting his papers away in his desk. It was rather shame than courage that induced him to slip out into the passage and lean over the banisters in his nightgown, listening. No light was visible; no further sound came; only a gust of warm, or even hot air played for an instant round his shins. He went back and decided to lock himself into his room. There was more unpleasantness, however. Either an economical suburban company had decided that their light would not be required in the small hours, and had stopped working, or else something was wrong with the meter; the effect was in any case that the electric light was off. The obvious course was to find a match, and also to consult his watch: he might as well know how many hours of discomfort awaited him. So he put his hand into the well-known nook under the pillow: only, it did not get so far. What he touched was, according to his account, a mouth, with teeth, and with hair about it, and, he declares, not the mouth of a human being. I do not think it is any use to guess what he said or did; but he was in a spare room with the door locked and his ear to it before he was clearly conscious again. And there he spent the rest of a most miserable night, looking every moment for some fumbling at the door: but nothing came. The venturing back to his own room in the morning was attended with many listenings and quiverings. The door stood open, fortunately, and the blinds were up (the servants had been out of the house before the hour of drawing them down) there was, to be short, no trace of an inhabitant. The watch, too, was in its usual place; nothing was disturbed, only the wardrobe door had swung open, in accordance with its confirmed habit. A ring at the back door now announced the charwoman, who had been ordered the night before, and nerved Mr Dunning, after letting her in, to continue his search in other parts of the house. It was equally fruitless. The day thus begun went on dismally enough. He dared not go to the Museum: in spite of what the assistant had said, Karswell might turn up there, and Dunning felt he could not cope with a probably hostile stranger. His own house was odious; he hated sponging on the doctor. He spent some little time in a call at the Nursing Home, where he was slightly cheered by a good report of his housekeeper and maid. Towards lunch-time he betook himself to his club, again experiencing a gleam of satisfaction at seeing the Secretary of the Association. At luncheon Dunning told his friend the more material of his woes, but could not bring himself to speak of those that weighed most heavily on his spirits. “My poor dear man,” said the Secretary, “what an upset! Look here: we’re alone at home, absolutely. You must put up with us. Yes ! no excuse: send your things in this afternoon.” Dunning was unable to stand out: he was, in truth, becoming acutely anxious, as the hours went on, as to what that night might have waiting for him. He was almost happy as he hurried home to pack up. His friends, when they had time to take stock of him, were rather shocked at his lorn appearance, and did their best to keep him up to the mark. Not altogether without success: but, when the two men were smoking alone later, Dunning became dull again. Suddenly he said, “Gayton, I believe that alchemist man knows it was I who got his paper rejected.” Gayton whistled. “What makes you think that?” he said. Dunning told of his conversation with the Museum assistant, and Gayton could only agree that the guess seemed likely to be correct. “Not that I care much,” Dunning went on, “only it might be a nuisance if we were to meet. He’s a bad-tempered party, I imagine.” Conversation dropped again – Gayton became more and more strongly impressed with the desolateness that came over Dunning’s face and bearing and finally – though with a considerable effort – he asked him point-blank whether something serious was not bothering him. Dunning gave an exclamation of relief. “I was perishing to get it off my mind” he said. “do you know anything about a man named John Harrington?” Gayton was thoroughly startled, and at the moment could only ask why. Then the complete story of Dunning’s experiences came out – what had happened in the tramcar, in his own house,and in the street, the troubling of spirit that had crept over him, and still held him; and he ended with the question he had begun with. Gayton was at a loss how to answer him. To tell the story of Harrington’s end would perhaps be right; only, Dunning was in a nervous state, the story was a grim one, and he could not help asking himself whether there were not a connecting link between these two cases, in the person of Karswell. It was a difficult concession for a scientific man, but it could be eased by the phrase “hypnotic suggestion”. In the end he decided that his answer tonight should he guarded; he would talk the situation over with his wife. So he said that he had known Harrington at Cambridge,and believed he had died suddenly in 1889, adding a few details about the man and his published work. He did talk over the matter with Mrs Gayton, and, as he had anticipated, she leapt at once to the conclusion which had been hovering before him. It was she who reminded him of the surviving brother, Henry Harrington, and she also who suggested that he might be got hold of by means of their hosts of the day before. “He might be a hopeless crank, “objected Gayton. “That could be ascertained from the Bennetts, who knew him,” Mrs Gayton retorted and she undertook to see the Bennetts the very next day. It is not necessary to tell in further detail the steps by which Henry Harrington and Dunning were brought together. The next scene that does require to be narrated is a conversation that took place between the two. Dunning had told Harrington of the strange ways in which the dead man’s name had been brought before him, and had said something, besides, of his own subsequent experiences. Then he had asked if Harrington was disposed, in return, to recall any of the circumstances connected with his brother’s death. Harrington’s surprise at what he heard can be imagined: but his reply was readily given. By way of answer Dunning had the episode in the Manuscript Room at the British Museum to relate. The end of the consultation was this. Harrington, who knew a neighbour of Karswell’s, thought he saw a way of keeping a watch on his movements. It would be Dunning’s part to be in readiness to try to cross Karswell’s path at any moment, to keep the paper safe and in a place of ready access. They parted. The next weeks were no doubt a severe strain upon Dunning’s nerves: the intangible barrier which had seemed to rise about him on the day when he received the paper, gradually developed into a brooding blackness that cut him off from the means of escape to which one might have thought he might resort. No one was at hand who was likely to suggest them to him, and he seemed robbed of all initiative. He waited with inexpressible anxiety as May, June, and early July passed on, for a mandate from Harrington. But all this time Karswell remained immovable at Lufford. He arrived accordingly, and they concocted plans. The train left Victoria at nine and its last stop before Dover was Croydon West. Harrington would mark down Karswell at Victoria, and look out for Dunning at Croydon, calling to him if need were by a name agreed upon. Dunning, disguised as far as might be, was to have no label or initials on any hand luggage, and must at all costs have the paper with him. Dunning’s suspense as he waited on the Croydon platform I need not attempt to describe. His sense of danger during the last days had only been sharpened by the fact that the cloud about him had perceptibly been lighter; but relief was an ominous symptom, and,if Karswell eluded him now, hope was gone: and there were so many chances of that. The rumour of the journey might be itself a device. The twenty minutes which he paced the platform and persecuted every porter with inquiries as to the boat train were as bitter as any he had spent. Still, the train came, and Harrington was at the window. It was important, of course, that there should be no recognition: so Dunning got in at the farther end of the corridor carriage, and only gradually made his way to the compartment where Harrington and Karswell were. He was pleased, on the whole, to see that the train was far from full. Karswell was on the alert, but gave no sign of recognition. Dunning took the seat not immediately facing him and attempted, vainly at first, then with increasing command of his faculties, to reckon the possibilities of making the desired transfer. Opposite to Karswell, and next to Dunning, was a heap of Karswell’s coats on the seat. It would be of no use to slip the paper into these – he would not be safe, or would not feel so, unless in some way it could be proffered by him and accepted by the other. There was a handbag, open, and with papers in it. Could he manage to conceal this (so that perhaps Karswell might leave the carriage without it), and then find and give it to him? This was the plan that suggested itself. If he could only have counselled with Harrington! but that could not be. The minutes went on. More than once Karswell rose and went out into the corridor. The second time Dunning was on the point of attempting to make the bag fall off the seat, but he caught Harrington’s eye, and read in it a warning. Karswell, from the corridor, was watching: probably to see if the two men recognized each other. He returned, but was evidently restive: and, when he rose the third time, hope dawned, for something did slip off his seat and fall with hardly a sound to the floor. Karswell went out once more, and passed out of range of the corridor window. Dunning picked up what had fallen, and saw that the key was in his hands in the form of one of Cook’s ticket-cases, with tickets in it. These cases have a pocket in the cover, and within very few seconds the paper of which we have heard was in the pocket of this one. To make the operation more secure, Harrington stood in the doorway of the compartment and fiddled with the blind. It was done, and done at the right time, for the train was now slowing down towards Dover. In a moment more Karswell re-entered the compartment. As he did so, Dunning, managing, he knew not how, to suppress the tremble in his voice, handed him the ticket-case, saying, “May I give you this, sir? I believe it is yours.” After a brief glance at the ticket inside, Karswell uttered the hoped-for response, “Yes, it is; much obliged to you, sir,” and he placed it in his breast pocket. Even in the few moments that remained – moments of tense anxiety, for they knew not to what a premature finding of the paper might lead – both men noticed that the carriage seemed to darken about them and to grow warmer; that Karswell was fidgety and oppressed; that he drew the heap of loose coats near to him and cast it back as if it repelled him and that he then sat upright and glanced anxiously at both. They, with sickening anxiety, busied themselves in collecting their belongings; but they both thought that Karswell was on the point of speaking when the train stopped at Dover Town. It was natural that in the short space between town and pier they should both go into the corridor. At the pier they got out but so empty was the train that they were forced to linger on the platform until Karswell should have passed ahead of them with his porter on the way to the boat, and only then was it safe for them to exchange a pressure of the hand and a word of concentrated congratulation. The effect upon Dunning was to make him almost faint. Harrington made him lean up against the wall, while he himself went forward a few yards within sight of the gangway to the boat at which Karswell had now arrived. The man at the head of it examined his ticket, and, laden with coats he passed down into the boat. Suddenly the official called after him,”You, sir, beg pardon, did the other gentleman show his ticket?” “What the devil do you mean by the other gentleman?” Karswell’s snarling voice called back from the deck. The man bent over and looked at him. “The devil? Well, I don’t know, I’m sure,” Harrington heard him say to himself, and then aloud, “My mistake, sir; must have been your rugs! ask your pardon.” And then, to a subordinate near him, “‘ad he got a dog with him, or what ? Funny thing: I could ‘a’ swore ‘e wasn’t alone. Well, whatever it was, they’ll ‘ave to see to it aboard. She’s off now. Another week and we shall be gettin’ the ‘oliday customers.” In five minutes more there was nothing but the lessening lights of the boat, the long line of the Dover lamps, the night breeze, and the moon. Long and long the two sat in their room at the’Lord Warden’. In spite of the removal of their greatest anxiety, they were oppressed with a doubt, not of the lightest. Had they been justified in sending a man to his death, as they believed they had? Ought they not to warn him, at least? “No,” said Harrington; “if he is the murderer I think him, we have done no more than is just. Still, if you think it better – but how and where can you warn him?” He was booked to Abbeville only,” said Dunning. “I saw that. If I wired to the hotels here in Joanne’s Guide, ” Examine your ticket-case, Dunning,” I should feel happier. This is the 21st: he will have a day. But I am afraid he has gone into the dark.” So telegrams were left at the hotel office. It is not clear whether these reached their destination or whether, if they did, they were understood. All that is known is that on the afternoon of the 23rd, an English traveller, examining the front of St Wulfram’s Church at Abbeville, then under extensive repair, was struck on the head and instantly killed by a stone falling from the scaffold erected round the north-western tower, there being, as was clearly proved, no workman on the scaffold at that moment: and the traveller’s papers identified him as Mr Karswell. Only one detail shall be added. At Karswell’s sale a set of Bewick, sold with all faults, was acquired by Harrington. The page with the woodcut of the traveller and the demon was, as he had expected, mutilated. Also, after a judicious interval, Harrington repeated to Dunning something of what he had heard his brother say in his sleep: but it was not long before Dunning stopped him.